Handcrafted in Bassett, Virginia. You can’t make it any better than this. MAPLE DINING Hand-crafted maple tops and finishes celebrate the natural beauty of the wood. Artisans enhance the look with a time-worn, heirloom aged effect. Your choice of straight edge or “live edge”, in 16 beautiful finishes (9 wood tones, 2 weathered finishes, and 5 painted finishes). OAK DINING Custom made wood dining tables in varieties of white oak and red oak. The artistic grain, natural markings, and range of colors give this collection textural appeal. No less than 8 distinctive finishes in a range of colors offering design versatility for many lifestyles. WINNING FINISHES All finishes are topped off with a final top coat of conversion varnish. The finish is then cured by air drying (rather than placing in a drying oven). This lengthy process ensures the solid wood construction is protected from harsh heat, while still providing incredible durability. The heart of your home deserves American made dining tables – hand crafted dining room tables and custom-made dining chairs by Bench*Made. Seat a few or plenty. All made just for you, one at a time, exactly the way you want it. With artistry, precision, and painstaking attention to detail, Bassett’s finest craftspeople create each Artisan Dining piece by hand. In fact, the entire Bench*Made line is made old school, in Bassett, Virginia where Bassett started making hand crafted American dining furniture back in 1902. Every piece is custom crafted from either solid red leaf maple or varieties of solid white or red oak. The timber is harvested from sustainable forests in the Appalachian region of the US. With artistry, precision, and painstaking attention to detail, Bassett’s finest craftspeople create each Artisan Table by hand. In fact, the entire Bench*Made line is made old school, in Bassett, Virginia where Bassett started making hand crafted benchmade tables and bench wood desks back in 1902. 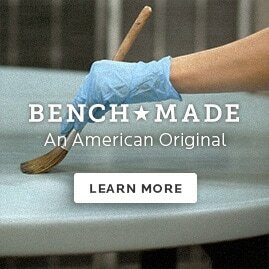 Bassett bench tables are American originals. The local skilled artisans, simple tools, enduring construction techniques, and time-honored woodworking benches (where the term “bench made” comes from) craft the goods you've been looking for. COME ON IN AND DESIGN YOUR OWN IN-STORE. Book a free personal design consultation or just stop by.